In order to have a good blaster, you need good ammo. Nerf blasters are already virtually as effective as they can possibly be given the use of .50 cal foam, and while BoomCo darts are a step in the right direction, they have some additional problems of their own. We can do better. Our current plan calls for darts which are broadly similar in construction to BoomCo darts, with a short straw body and a narrower head to allow for use in long barrels and to improve feeding in magazines. Shortening the darts carries several advantages; it makes blaster design easier as the bolt needs to travel a shorter distance in magfed blasters, lightens the dart and thus allows for a higher velocity at the same kinetic energy density (i.e. more range without more hurt), and allows for smaller magazines. Currently, the degree to which such darts can be shortened without suffering from aerodynamic instability is unknown, both for stock-class and NIC-worthy velocities. With more rigid and slippery design of dart, high-capacity magazine designs similar to those used in firearms could be used. While Goldbergesque designs with very high capacity are unreliable even given the high level of engineering and manufacturing tolerances of firearms, we can make good use of one particular magazine technology from this field: double-stack box mags. 45 double-stacked .40 cal darts could fit into the same length of magazine as 18 single-stacked .50 cal darts. That's a pretty darn good capacity. The image on the left shows a conventional double-stack mag as one might see in a firearm. Note the equilateral triangles. If you feed BoomCo darts into a Nerf mag, they fit double-stacked with isosceles triangles. They don't feed well, of course; even if there were no other problems, the lips would still be entirely the wrong shape. Worse still, the fact that the darts form isosceles triangles means that each dart is pressed outwards with a force proportional to the force compressing that part of the stack. This creates a feedback loop: the more darts you have, the more force you need to feed them, which means that the darts press against the sides of the mag more and experience more friction, which means that you need more force to make them slide . . . The upshot of this is that, in a poorly designed double-stack mag with an isosceles triangular pattern, the required feed force increases quadratically with the number of rounds present, which puts a harsh limit on how many rounds can be stored in a magazine while ensuring a reliable feed. On the other hand, if the magazine is very slightly larger than it needs to be to create an equilateral triangular pattern, we will have, in effect, two parallel stacks of darts which do not press against each other or the sides of the magazine to an appreciable degree. So, I propose that we use double-stacked magazines, and furthermore that we do not use BoomCo darts crammed into Nerf mags as anything more than very rough prototypes as such a system will not represent the true potential of well-designed double-stack magazines. While on the subject of magazines: I'm considering using magnets to hold the magazine in place. This would eliminate the need for a latch, which would both eliminate one source of magazine alignment problems and expedite reloading. This proposed blaster fires from an open bolt, which makes reloading as simple as pulling out the old mag and sliding in a new one. Pulling the trigger operates the breech, either via a leaver as in a Stryfe, or by gears (both the bolt and the trigger are shown in the diagram, both in the non-firing position, but the connection between them is not). As the bolt has to travel a little further than the full length of the dart, and the dart should be close the half the length of a Nerf dart, the length and weight of the trigger pull should be similar to that of a Stryfe - probably a bit better, given that smooth plastic darts should require less force compared to foam to slide them out of the magazine. The breech is similar in design to a brass breech - although it probably won't be made of brass. You can find a good picture showing how they work here. As the bolt moves forwards, it pushes the dart directly from the magazine into the chamber - and the chamber is just the part of the barrel adjacent to the magazine. The bolt itself - usually the front part of the bolt, but here the entire thing - is a tube which lets air into the chamber. The only tricky issue is where to attach the bolt to the rod or sled which moves it, as the rear part of its path is surrounded by a backpressure tank (explained later), and the front part of its path is surrounded by the mag's lips on either side, the magazine itself below, and a continuation of the barrel / chamber (which acts as a guide) above. Cutting a slot in the aforementioned guide would probably be the best way to do this. A small backpressure air tank rests behind the breech and feeds into the rear of the bolt. You can find an explanation of how backpressure tanks work here. The details of the design can vary - backpressure tanks can use sliding plates or diaphragms as well as the sliding block shown in the link. Placing the backpressure tank here results in an unfortunately large amount of deadspace - the length of the deadspace is a little over twice the length of the dart, and the width is not much smaller than that of the barrel (because making the hole through the bolt too small would restrict airflow). Placing the tank anywhere else would likely result in worse problems, though. Feeding air into the bolt from any position other than the back will result in the bolt blowing back during firing, and feeding air directly into the chamber might dent the dart (and would still blow back the bolt). In addition to moving the breech, pulling the trigger also operates a semi-auto (SA) valve. Here's an example of an SA valve - but, for this blaster, we want something slightly different. This much is similar to the linked example: in the non-firing position (shown), the tank is connected to the air supply. As the trigger pulls the plunger back, the middle of the three O-rings passes over the hole leading to the tank, sealing the tank off from the air supply. Here's the difference: the plunger can move further, moving the foremost O-ring past the hole leading to the tank, venting the tank and causing it to fire. (In the linked example, a separate system causes the tank to fire when the trigger is pulled). Two O-rings are needed at the front of the valve in order to prevent a situation where the air supply can vent to the atmosphere; if there were only one O-ring at the front then, when it is directly over the hole, air from the air supply could go into the hole one one side and out to the atmosphere on the other. Also note that, thanks to the O-ring in the rear, the force exerted on the plunger by the pressurized air always cancels, so the operator does not have to fight against the air pressure to pull the trigger. So, air, you say? Where does it come from? There are several ways that the user could supply their blaster with air. In the basic, "out of the box" version of the proposed blaster, a pump with a VFG handle attaches to a picatinny rail on the underside of the barrel shroud, and feeds into an input port on the front of the blaster. Alternatively, the user could attach a HPA system to a connector at the bottom of the grip. In either case, there will be an airtank in a removable stock which stores air at high pressure, and an adjustable pressure regulator in the blaster, which supplies air to the backpressure tank at a consistent pressure. 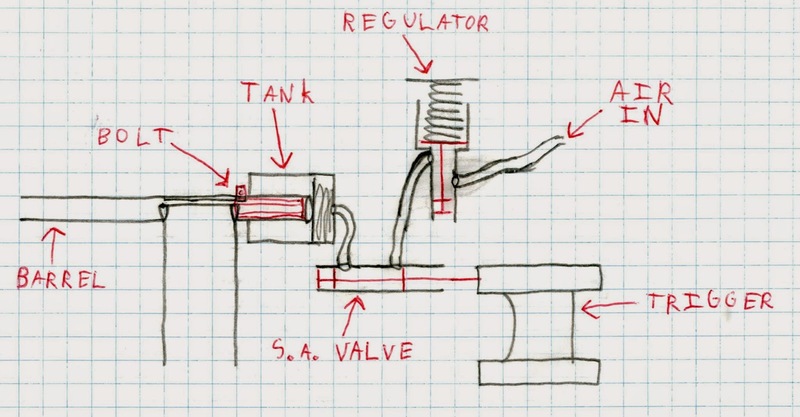 Two overpressure release valves will probably be needed for safety: one between the regulator and the tank (adjustable, set to the same pressure as the regulator, to prevent regulator leaks from leading to excessively powerful shots) and one before the regulator (not adjustable, set to prevent excessive input pressure from destroying the blaster). Alternatively, the regulator could be designed in such a way that a leak in any of the O-rings would lead to air venting rather than excessive pressure downstream of the regulator, in which case only one overpressure release valve would be needed. The main advantage of this system would be that it is easily adaptable and customizable. Do you want to use the blaster out of the box? You can, and you'll just have to pump it first. Do you want to use a HPA rig? Sure, no problem. Do you want to use the same blaster in HvZ and an NIC war? It's a simple matter of opening the shell and turning a screw. Do you want to use your blaster with a larger pump to fill it faster, or a smaller one to more easily achieve high pressures? How about a different size of pressure tank? How about a pressure tank with a built-in compressor? All of these things, if released later, would integrate cleanly into a pre-existing system. How does it compare to Nerf blasters? There are several advantages that this proposed system offers Nerf blasters: higher capacity magazines, more accuracy, and a smoothly adjustable velocity. That last point deserves a little elaboration. Nerf blasters do not have easily adjustable power levels. Replacing springs requires extra springs and is hardly a convenient process, toning down flywheels by dropping voltage impairs windup and recovery, and toning up flywheels by increasing the voltage only works up to a certain point (the well known glass ceiling of about 110 FPS). On the other hand, an adjustable pressure regulator would make for a great way to adjust the power level. Rampage/EAT: The pump action is similar, except that the operator is not restricted to alternating pumping and firing - they can fire several shots rapidly if desired. This system cannot match the short trigger pull of a manual springer, though. Stryfe: When used with an external air supply, this blaster would perform much like a Stryfe - a Stryfe with no need for an acceleration trigger, over double the capacity, and a smoothly adjustable velocity, that is. Rapidstrike: Unfortunately, there is no good way to make this system fully automatic. However, see the next section. Sounds good, but can we make it better? There are several problems with this design: the long trigger pull, the large deadspace, and the inability to make the blaster fully automatic. All of these could be fixed by swapping the backpressure tank and SA valve for a something similar to a Magstrike mech. 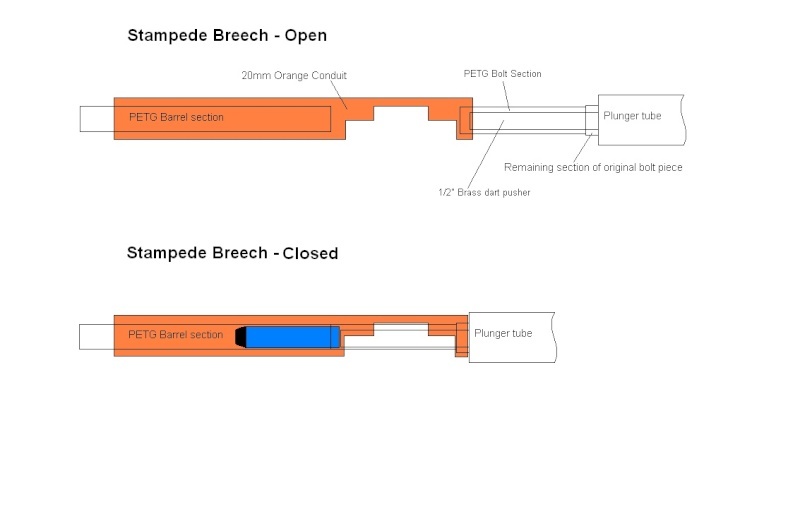 We'd need to add cycle control to prevent darts from being left partially pushed into the chamber - which would either lock the mag or mangle the darts if the operator attempts to reload - and might need to do something to prevent air loss caused by the breech opening before the dart leaves the barrel. Aside from these (solvable) problems, the Magstrike mech is a good system. I'm currently thinking about how to solve these problems. I like everything so far except needing new mags. I have enough invested in Nerf mags and pouches to carry them, I would be happy to stick with a straight 18. I am not convinced the proposed mag method will work for foam. You should PM Nerfarmourer on Reddit, he might have some insights for you. You are right, a double-stack single-feed mag wouldn't work with foam - which is why we aren't thinking of using foam. We are thinking of using BoomCo-like darts, which are slippery (or would be if the grippy head were narrower) and have a rigid section at the tip thanks to the plastic insert which holds the head to the straw shaft. Hey... that looks like my design, aside from the darts! Felix: Basicly what you want is a paintball gun chambered in nerf/ custom dart sizes. Pneumatic, adjustable with a regulator, different sized air tanks, semi auto with no electronics, full auto or burst with electronics, magazine fed(some are). Only thing they don't do that you want is a hand pump option. Any pics on a working prototype?? Perhaps a semi auto would still be okay if you could work out a fast and light trigger pull for fast repeat shots. Couldn't you make it full auto by adding some sort of lever that would detect darts in the chamber?